The SharePoint Framework has been around for a while now and is being adopted by many of you, whether using on-premises, SharePoint 2016 or SharePoint Online. The tooling is made up of common web development platforms and components. A Yeoman plug-in for use with the SharePoint Framework. Using this generator, developers can quickly set up a new client-side web part project with sensible defaults and best practices. Defines the core libraries for client-side applications built using the SharePoint Framework. The SharePoint Workbench is a standalone environment for testing and debugging client-side web parts. Module loader for managing versioning, loading of client-side components, web parts, and other assets. It also provides basic diagnostic services. It is built on familiar standards such as SystemJS and web pack and is the first part of the SharePoint Framework to load on a page. Defines several module interfaces that are shared by the SharePoint Framework module loader and also the build system. Custom bundle of lodash for use with the SharePoint Framework’s module loader. To improve runtime performance, it only includes a subset of the essential lodash functions. Custom tslint rules for usage with SharePoint client-side projects. Custom bundle of office-UI-fabric-react for use with the SharePoint Framework’s module loader. A collection of tasks for the SharePoint Framework build system, based on gulp. The sp-build-core-tasks package implements operations specific to SharePoint, such as packaging solutions and writing manifests. Imports and configures a set of build tasks that are appropriate for a build target that runs in a web browser (as opposed to a Node.js environment). This package is intended to be imported directly by a gulp file that uses the SharePoint Framework build system. A wrapper for web pack file-loader that can be used to modify the casing of the resulting file name. Useful in some scenarios, such as when using a content delivery network (CDN) that only allows lowercase file names. A loader that wraps the loading of CSS in script equivalent to require(‘load-themed-styles’).loadStyles( /* css text */ ). It is designed to be a replacement for style-loader. A loader that loads a script file’s contents directly in a web pack bundle by using an eval(…). A loader that sets the webpack_public_path variable to a value specified in the arguments optionally appended to the SystemJS base URL property. It is important to understand the components that the SharePoint Framework uses, just as it is to know what is within the generated project. If you look at the list of components used within the SharePoint Framework, you will see two specific components. The first is “tslint” listed as a core package; the second is “jshint” inside each project. 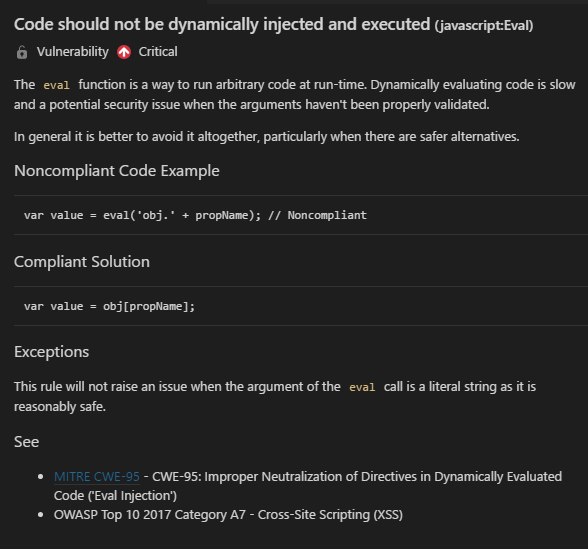 The SharePoint Framework components can validate basic security rules by iterating a series of rules that look for some of the common risks. The following table lists the iterated common rules. no-eval tslint Do not use the ‘eval’ function or its functional equivalents. use-strict tslint Always enable strict mode when possible. no-octal-literal tslint-microsoft-contrib Do not use octal literals or escaped octal sequences in strict-mode compatible code. no-duplicate-parameter-names tslint-microsoft-contrib Do not duplicate parameter names. no-delete-expressions tslint-microsoft-contrib Do not delete expressions. no-disable-auto-sanitization tslint-microsoft-contrib Do not disable auto-sanitization in frameworks or application helper code. no-exec-script tslint-microsoft-contrib Banned term – execScript. no-string-based-set-timeout tslint-microsoft-contrib Do not use the version of setTimeout that accepts code as a string argument. However, it is acceptable to use the version of setTimeout where a direct reference to a function is provided as the callback argument. code as a string argument. However, it is acceptable to use the version of setInterval where a direct reference to a function is provided as the callback argument. no-string-based-set-immediate tslint-microsoft-contrib Do not use the version of setImmediate that accepts code as a string argument. However, it is acceptable to use the version of setImmediate where a direct reference to a function is provided as the callback argument. no-function-constructor-with-string-args tslint-microsoft-contrib Do not use the version of the Function constructor that accepts a string argument to define the body of the function. no-banned-terms tslint-microsoft-contrib Do not access terms or variables that create ambiguity or are banned in strict mode. no-reserved-keywords tslint-microsoft-contrib Do not use reserved and future reserved keywords as identifiers. no-document-domain tslint-microsoft-contrib Do not write to document.domain. Scripts setting document.domain to any value should be validated to ensure that the value is on a list of allowed sites. These rules are added to each project and validated as the code is defined and built. To see the current rules, navigate to the “tslint.json” file, you will see them listed in a “JSON” structure. Though this is great, the current rules only cover specific coding standards or security risks. The ability to scan a project fully and identify specifics is no small task; however, at least for now, you can include other packages that perform a deeper scan. “TSLint” uses a “TypeScript Compiler API” to read each file and compile it into an abstract syntax tree (AST). “TSLint” then exposes an easy to use “visitor pattern API” to each rule so that it can read and verify attributes of the tree. 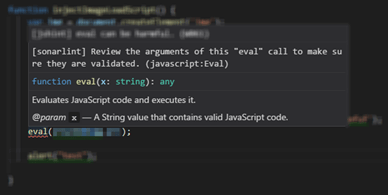 To make a new rule about any element such as a “Try-Catch,” you write a Typescript class that overrides the “visitCatchClause” method, performing specific checks. If you want to analyze return statements, override the “visitReturnStatement” method. There are approximately seventy visitor methods to overwrite as needed. The following describes how to write these rules. 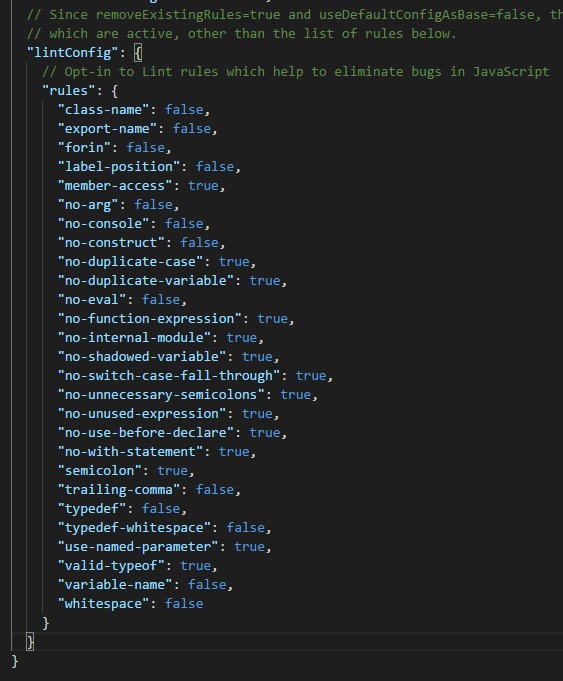 Writing custom rules for each type of code block you want to check will help in defining not only better code but better security practices. The downside of this is the time it will take to create the rules along with testing. Do we trust the rules or can we use anything else for checking? Right now there is no magic way of validating the code written, outside of the core “tslint” mechanism along with custom rules. There are though, a few custom packages that work to extend the validation process. For example, you can use “tslint-config-security” or “eslint-plugin-security“, both of which are similar to the “tslint-microsoft-contrib” project. Click the “Install” link and wait for it to complete. To use it, you need to make you have the Java JDK installed. Once installed, modify the “Visual Studio Code” settings filed to update the location of the “Java Runtime version 8“. After updating, you will need to restart “Visual Studio Code” for the new property to take effect. You will then be able to hover over your code and see that “SonarLint” is working. When the code inspection runs, you can look at the reasons why something is flagged, such as in this example using the “Eval()” function. Clicking the link explains in further detail the impact of the code. This tool is very powerful, albeit needing to be configured and installed to work, but it goes further than the standard “tslint” rules to ensure code is secure. The Rencore Platform addresses the three main areas of the SharePoint application lifecycle: Pre-production, Production, and Modernization. Click the button below to learn about learn about quick wins for application security and extending SharePoint.